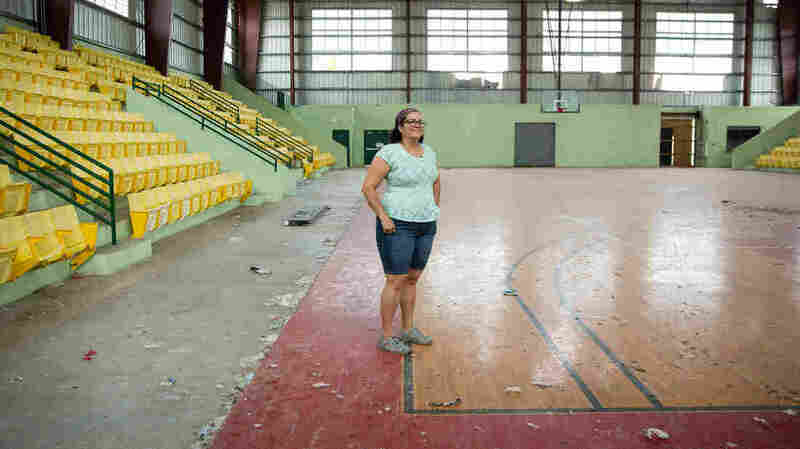 Vieques Still Finding Its Footing After Hurricane Destruction The problems facing the mainland in the aftermath of hurricanes Irma and Maria didn't skip this remote Puerto Rican island. But tourists still come and houses continue to sell. 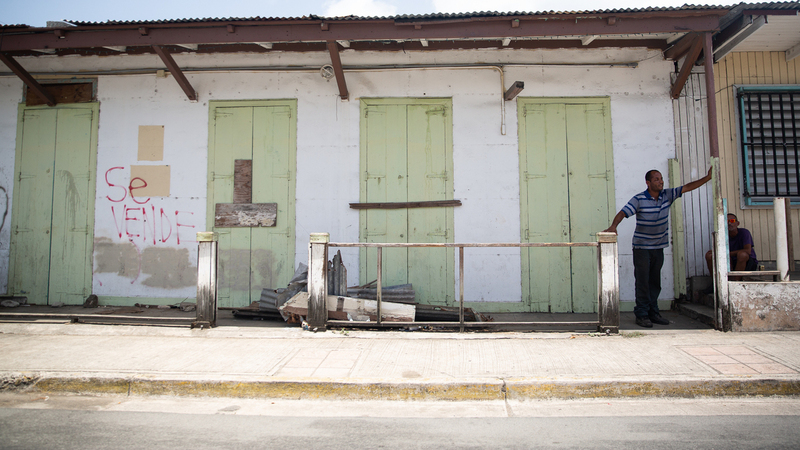 A building for sale in the town of Isabel Segunda in Vieques. In the windy shade near the ferry terminal is a small square with a tower in the middle. It's called Plaza Hijos Ausentes — the plaza for absent children. It's a place to honor those who were born in Vieques, but who chose to leave. Or who had to. "It's always been an issue in Vieques," says Elda Guadalupe Carrasquillo, a municipal legislator and middle school science teacher who has lived here since she was a child. "Normally, our kids ... they go to study and it's very few that can come back and work here. So they did this monument to honor that they lived in Vieques and they're called sons and daughters of Vieques. Although they're not here now. They're absent." 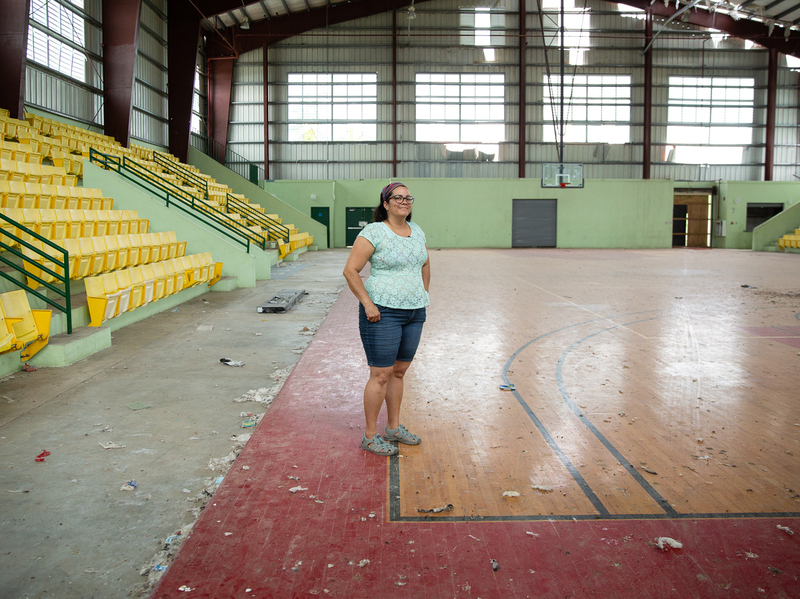 Elda Guadalupe Carrasquillo, a municipal legislator and a middle school science teacher in Vieques, Puerto Rico, stands on the island's only wooden basketball court. It was wrecked during Hurricane Maria. Since then, it's only been used by birds and roaming horses. Puerto Ricans have left their main island for decades in search of opportunity and Vieques is no different. But it's more remote than its bigger neighbor. In good times, it isn't always easy living here. Now, it's worse. Take, for instance, electricity: the underwater power connection that used to bring power from Puerto Rico may be out of service for four years. Robert Rabin isn't from here, but he's lived here for 40 years and runs, among other things, the island's community radio station. He says the island's history also distinguishes it from mainland Puerto Rico. "We're still suffering the impact of over half a century of military control that blocked natural development — leaving the people of Vieques, you know, years behind in terms of economic capacity, economic development, social development," Rabin explains. So tourism is what there is. And when it hurts, the whole island hurts. But Rabin also knows that he — a guy who came here to write a college thesis and stayed — could be seen as part of the problem. It's a contradiction he lives with. Lin Wetherby is a real estate agent here. She's fended off her share of speculators — one offering $50,000 in cash for five houses. What's important to her and to homeowners is that the properties she's working with — often at the higher end of the island's market — hold their value after the storm. And, based on her evidence, it appears they may be. "I had four contracts at the time Maria hit us," she says. "I pretty much figured maybe I'd get two of them to close. We're actually going to close all four." Wanda Bermúdez, a Vieques native, is hanging out on the back patio of her mother's downtown home, surrounded by windchimes. She likes tourism, but not necessarily the kind that leads to a land grab. "OK, yeah, we need tourists," she says, "we don't need them to stay." Bermúdez says the real estate market skyrocketed after the Navy left. Fifteen years later, she was hoping Maria would have provided a correction to the recently hot market — making it more affordable for locals. None of her cousins can own their Vieques homes. That all said, if the island's complicated history has created some unavoidable tensions, she feels them, too. She fears locals will get pushed out by market forces. And, even with all of that, she just sold a beachfront home to an island outsider who could buy it. And almost at top dollar. "I'm guilty as charged," Bermúdez says. "Here I am. I sold to an outsider." And, for her, the whole situation is emotionally hard — even more so because the things Bermúdez loves most about Vieques are still in recovery. There are no ripe mangos here. The shade trees at the beach are stripped of their leaves. And, at least for her, it feels like it's going take a long time for the island to grow new fruit.